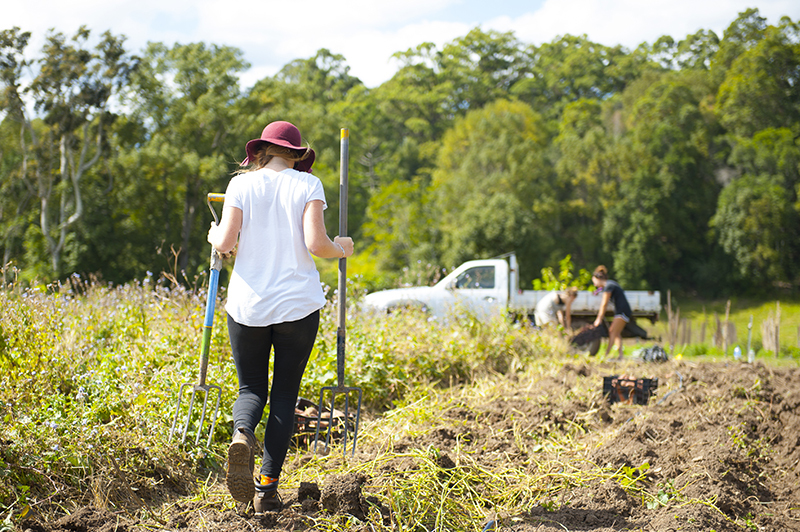 Our volunteers and WWOOFers (Willing workers on organic farms) are spiritually interested young people from all over the world - a fascinating mix of social and cultural backgrounds! Since we are all co-creators of the Krishna Village atmosphere, we are very selective about the kind of people we invite to stay with us. So we kindly ask you to come with an open heart and mind to experience the sattvic way of life: simplicity, health, vegetarianism, spirituality and personal growth. The Krishna Village is a retreat centre, but first and foremost, the Krishna Farm is a spiritual temple environment, so your behaviour should reflect this. We are looking for people with a friendly, open-minded attitude, a great service attitude towards our retreat guests and course participants and a decent work ethic, including punctuality and the commitment to give your best. We also require a solid level of English so you can carry out your work and participate in the classes. Cigarettes, drugs, alcohol and public non-spiritual music are not welcome on the farm, nor are meat, fish and eggs. Please make sure to fully abstain from these things during your stay to get a full experience of what the Krishna Village is about. Also, being a yoga community and retreat centre, we dress in a respectable and modest way. Walking around bare-chested, or in overly sensual dress is not appropriate. Before you apply, please read our complete Code of Conduct and see whether you feel aligned with our values. Please understand: We are a spiritually oriented yoga retreat centre, not a party hostel, so please only sign up if that's what you are looking for. As a volunteer, your minimum stay is four weeks and the maximum length of stay is three months. If you wish to stay for more than one month, the initial testing period is one week. After that, we will give you feedback and discuss with you whether or not you can stay on. Our decisions are based on our current booking situation as well as work ethics (punctuality, efficiency ...), participation in yoga classes, talks and community life and getting on well with your fellow volunteers, managers and our retreat guests. We work for 5hrs/day on 6 days/week (Sun-Fri) and rest on Saturdays. We start at 6:15am every morning and mostly work in and around the Krishna Village gardens, kitchen, cleaning team and maintenance. At 8:15am we have a 1hr breakfast break and finish work at 12:15pm, right before lunch. In the afternoon we start kirtan and yogic living classes at 1:30pm. You can come along (which would be great) or enjoy a swim, drive to the beach or relax. The yoga and other classes on the regular Krishna Village retreat schedule and at our temple are available to you free of charge. Generally, you don’t have to pay for anything, yet some extra cost may apply if you want to use the internet, coin laundry, participate in courses or buy your own food in addition to what is provided. As of Monday 23 July 2018, we will be running occasional mandatory Bhakti yoga lifestyle and philosophy classes for all volunteers. Given that you will be serving our students and retreat guests (and, in this way, representing Krishna Village values), we need to make sure that you are trained in and committed to yogic standards. We will be covering the Yamas and Niyamas as well as related topics found in Patanjali's Yoga Sutras and the Bhagavad Gita. Otherwise, class and kirtan attendance is encouraged but not required. We provide 3 delicious vegetarian meals every day, with lunches (vegan) taking place at the Krishna Village community kitchen, and breakfast and dinners - mostly Indian style - served at the prasadam hall, next to the temple. We grow as much of our own organic food as we can, and otherwise buy locally (non organic) wherever possible. If you have any special dietary requirements, you are also welcome to bring what you need and cook your own meals at our community kitchen. In terms of accommodation, we have a beautiful camping area that suits tents and camper vans, whichever you prefer to bring. We often book out, so please make sure to apply at least 6-8 weeks in advance. If you require a room, please have a look at our Karma Yoga option. Please note: We require a $5 housekeeping fee and a $50 bond per volunteer in cash upon arrival to make sure people treat the place with respect and don't leave rubbish, old tents and other items behind. The $50 bond will be refunded in full on the day you leave upon checking out at reception, so please make sure to come by in person before you are heading off. In case of misconduct (e.g. causing disturbances with other guests, not showing up / being late for work repeatedly, being asked to leave etc.) or still owing money, we will keep the bond (partly or in full) to make up for what's owed. New Govardhana serves as an ashram to a community of yogis who aspire to live according to their deepest vows and commitments on their path of service, spiritual contentment and happiness (Bhakti Yoga). Their service and dedication make this location a beautiful place of growth, healing and spiritual awakening. If you are interested, please come along and visit our beautiful Radha Govardhandhari temple and learn ore about the origins or our "simple giving, high thinking" philosophy. To see if this experience is for you, please read our FAQ for volunteers and have a look at our Code of Conduct as well as our our page about Bhakti Culture, our way of life. If you are dealing with any physical or mental health issues, please also check our Are you ready page to make sure this is a suitable experience for you. 2nd year visas are not available anymore. We used to provide them, but as of 31 August 2015 the Australian government has changed the laws so that only paid work is eligible. For more details, please see the website of the Department of Immigration. New volunteers always start on Mondays, with a Welcome Tour at 11am NSW time. This tour serves as a mandatory briefing so that you understand our values and standards and can fit in well. Please apply 6-8 weeks in advance, otherwise we might not be able to offer you a spot. If you think you are the right kind of person for the job, please fill in our online application form. If you have any additional questions, please contact us.